Discussion in 'Whitetail Management' started by KSHUNTER, Jan 30, 2018. I have a couple semi open spots on my farm, a few larger cedar trees, but mainly just fescue. 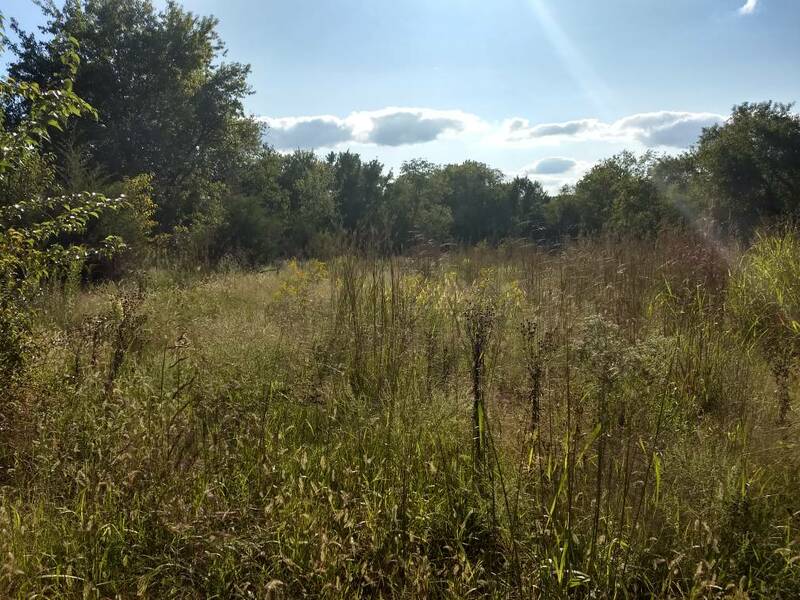 The farm used to be pastured and fescue is pretty thick everywhere, and the fescue has formed that wonderful thick low growth mat that has no wildlife value and suppresses most other growth. These areas have to many downed trees/rocks/stumps that makes used a native grass grill impossible. I would like a little input on how maybe best to start improving these open areas on my farm that deer do not utilize at all and is just wasted area. My current train of thought is that as soon as possible while the fescue is completely dormant and brown is to burn all these areas. this would remove all dead vegetation and get the ground opened up to sunlight and allow spray ground contact. Then I would wait until late March or early April until the fescue is actively growing and spray with roundup, roundup/panoramic or roundup/atrazine. I have a 40' boomless sprayer and a portable gps, I may not be perfect on my coverage with all the obstacles, but I think I will be pretty close. My thinking is that this would severely set back the fescue and hopefully suppress it enough to allow the natural seed bank to take off. There is some native already growing, so I was hoping I could get by with out seeding. Thoughts and opinions are very much appreciated on the easiest way to transform these areas. I do not necessarily need more pure native stands/I would be content with weeds and brush, anything is better than this dang fescue! I'm very open to any other ideas, especially on chemical selections, timing, and methods of conversion. You are on the right path for sure... well down it. Lots of option. Given the "stump/rocks/etc" issue I think this is what I would do. Burn (anytime its dry enough), frost seed switchgrass in March. It is easy to broadcast by hand so that's why I say switchgrass (unless you have a specialty truax spreader or similar that can handle the fluffy natives). You can just walk it not have to worry about a drill or other machinery with "obstacle" situation. Then yes, a couple rounds of roundup & atrazine. Might have to come back in fall and spray again when switch is dormant if fescue persists. 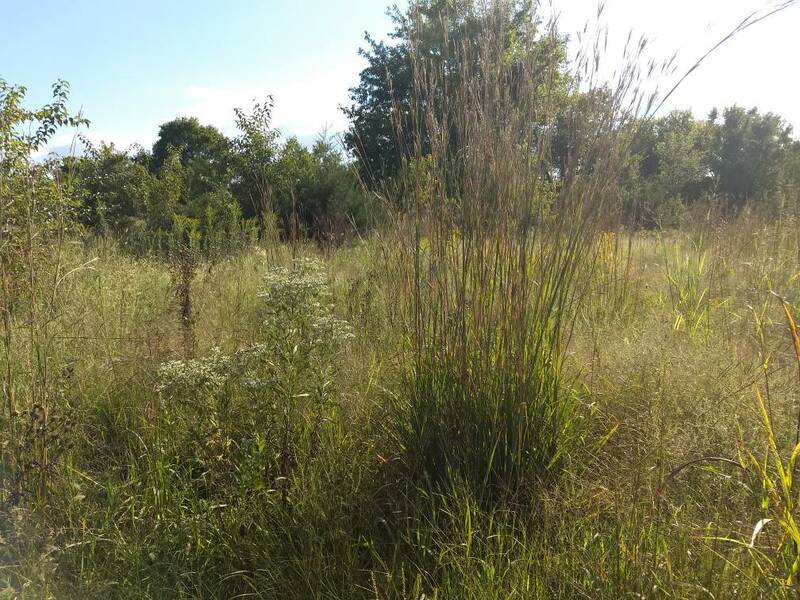 See Dbltree thread on switchgrass. But yeah.... your thinking 100% right... kill that junk!! Give Don Higgins a call at Higgins Outdoors. He is an expert on Native Grasses and can sell you the right seed for your area. Tell him Patrick Simpson sent you! Since you are are in Kansas you may want to give your county extension agent a call or even contact K-State. 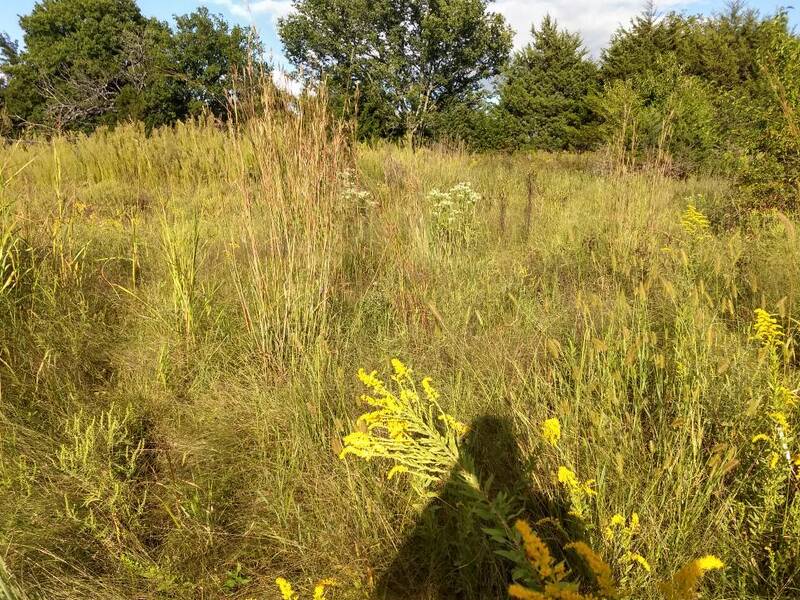 They have done so much research on Native Grass with their Konza Prairie project. Here is a link to some of the grasses suggested. It could vary depending on what part of the state you are located in. I have gone back with Big Blue Stem personally because I am in the Flint Hills region. I have worked with NRCS quite a bit on the property through the WHIP program. I did a 10 acres native grass conversion from cool seasons, but I was able to plant beans and use a native grass drill, ended up with a great stand. I can get some native grass through my NRCS office for free through some quail program, but spreading it would be an issue. There is some Big Blue already present, I like the idea of the switch but with the price of seed being pretty high I might wait until next spring and just focus on getting the fescue under control and give the switch the best chance of survival. I think I seen someone mix floor dry with native grass seed and got it to flow through a spreader, anyone ever have any luck with that? I really don't care if I have a pure switch stand, I just want to knock the dang fescue and anything that comes up would have better wildlife value than what is there currently. Here is a few pictures of the areas I want to improve, I think it could be converted into some really good habitat. How many acres??? U have very viable options here. I used a truax NWSG spreader with the seed and bedding mix.. Turned out to be a great stand. In fact, comparable to stands I drilled. I have 3 patches, one 7 acre patch and two 5 acre patches. On the map the orange areas are where I would like to improve native and make areas thicker. Areas 1 and 2 are the biggest priority, area 1 is about 5 acres and area 2 about 7 acres. If I can obtain the NWSG seed through my NRCS office would that change up chemical selection? Would you just burn and round up a couple of times before NWSG can germinate, add panoramic? I don't know what the germination will be but I have some 3 year old NWSG seed from my other plantings that I might play around with the micro chip shavings and see if I can get it to flow through my spreader. Areas 1 and 2 border my biggest block of cover, and where most of the deer bed. I feel like the open areas along the border pushes them farther into the property and reduces holding capacity of the tract. I preformed a lot of TSI through the rest of the property, and planted 400-500 oak trees, I need to go through and do another round of TSI but the property has gotten much thicker since the time these aerials were taken, but still have plenty of work to do to get fescue eliminated within the timbered areas also. 1) yes- fire and plateau would free up a lot of existing natives. It won’t kill fescue so post emergent gotta also be used with full force here. The chance fire burns trees- I wouldn’t do it. I like trees like that & great habitat in ur example. Some don’t. I do IMO. U could do a couple years of fire and plateau and post emergents before natives germinate but that’ll take more time. Does work though. 2) I’m going to guess based on pics: ur in some rougher soils - pretty obvious. If that’s in fact the case - I’d narrow to BB stem and Indian grass. IF u have dark soils or wet soils- chime back as switchgrass is a great choice for better quality. But- ur natives there look like BB or Indian so that’s indicating whAt will do well. Stick with it. It’s a great combo. 3) 2 choices.... wanna do it this year’s growing season or next year? If this year..... anything to mow around trees or burn without frying trees is good. I’d spray 2 times if possible. NUKE IT!!! 4-6 qts round up (or 40 oz liberty), crop oil, ams & even some clethodim + 12-14 oz plateau/panoramic- around may 1st-Ish. If u need to spray green growth again, if fescue bad - I’d hit it again when u plant. Now.... u could plant now. Could do later too. Drill. Yes- stumps and rocks- it’s doable. I’d prefer to do it with FLUFFIES when u cut & kill grass but u can do it now. Rocks and stumps- smaller drill or go around them And/or go very slow. Remember - we want ur seed to be 1/8th inch in soil. If it sat on dirt- that would be ok. Want to cut residue there though (drill or burn or mow & spray) one way or another. Our goal - whatever the grass (fluffy or switch) is to get it on the soil for contact or 1/8th inch-ish in the soil. Golden!! Switch can be drilled of course or broadcast and fluffies drilled with agitator fluffy box on drill. FLUFFIES have 2 other options: shoulder held “seed slinger” or atv mounted. I think truax or one of drill companies makes that option. I prefer drill and if u do “slinger” u pry wanna wait a year til ur soil top is clean of residue. 12-24 oz of plateau/panoramic a year is fine. I’ve done 36 oz with no issue. Key is killing fescue deader than dead. 2 sprayings may help there and can’t hurt & not really expensive. I drilled TODAY into “concrete” (frozen soil) & it’s fine- I just barely scratched the soil surface and dropped seed in. Rocks and stumps - obviously navigate those & go slow. Not impossible by far. Slow and cautious- be fine. Seeding now or later- fescue is gonna be up for a month while nwsg’s stay dormant so plenty of kill time on fescue. There is more options on how to do this. This is very doable and not bad at all. In the essence of not writing a novel - lemme know what other ?’s and what I’m missing or possible other ways u wanna try and do this. Thanks for all the responses and direction! I would like to keep as many of the trees as possible also, but I think there is some areas I can burn off with out much harm. As thick as the grass mat is I think it would be best to burn what I can, and then mow and spray everything else. The soil profile is 8957—Wagstaff-Shidler complex, 1 to 8 percent slopes; Wagstaff(class 3e soil) is good soil, Shildler (class 7s soil) is poor thin soil. Area 1 is absolutely way heavier on the shildler soils and BB and Indian Grass will definitely be the best option there. Area 2 is seems like way better soil, as most of it is flat or sloping towards the creek. I have a small apple orchard in the corner of area 2 and it was dark soil and no rock problems, so may shoot for utilizing SG in area 2. This weekend is supposed to be windy, if the weather will hold Saturday morning ill see if I can get some of it burnt. It is not being utilized much at this point, so even if I just get fescue controlled this year and I plant next year ill still be better off than just waiting until next fall to start trying to kill the fescue. I think about half of the acreage I can burn and get a good exposed soil, and possibly get some seeded this year and feel pretty confident, but that will be based on how well I can get some of it burnt. Our NRCS office doesn't have a native drill, have to rent from the implement place and useless it has changed from last time it is 15' which would limit the areas I can get through and around with it. I will look tomorrow and see if how much of the area I can get over with the drill. Waiting a year to plant may be the most viable option but regardless I can get a head start on it this year if nothing else. I seem to remember seeing a native drill sitting somewhere around that was only like 8' or so. If I can find who owns it and if he would rent then I could get over a ton of the ground with it. Right now you have gave me a ton of information and great direction. Ill see what I can come up with and get done over the weekend if it isn't to windy and go from there. Thanks guys for all the great direction, I know doing anything is probably better than nothing, I can do it once the right way, then that is what I would rather do. 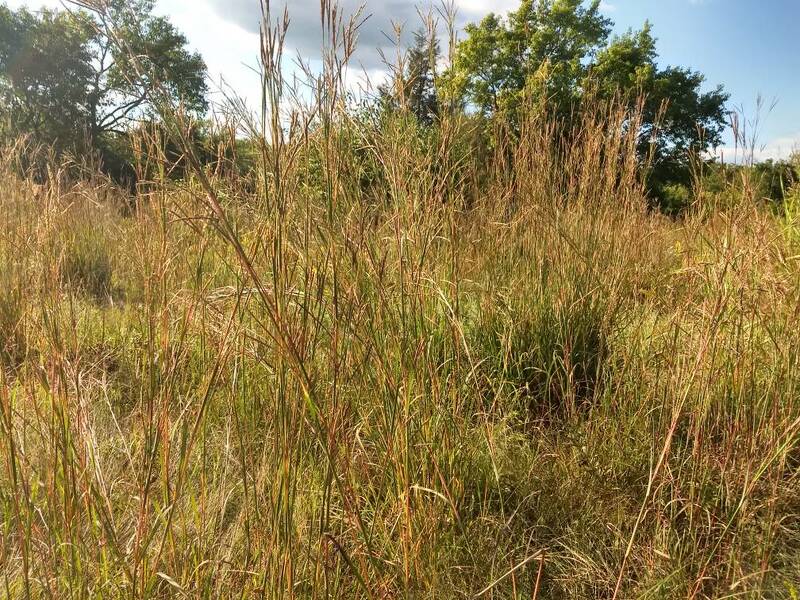 If you have a Pheasants Forever chapter nearby, you might check with them about a native grass drill or where to find one. Most native drills are designed to skip over buried rock if you go slow. Good luck! I have one for these exact scenarios. It works great. I found you still have to cut the seed with the chips otherwise it puts way too much out (no way to regulate/adjust it). I decided to try some prescribed burning because the amount of ground cover was so much I figured it would hinder herbicide applications. I tried some small areas first to see if I could control the fires as I did not want to burn very many trees. I lit backing fires into the wind, with some good wind speed, and was able to control fire intensity, speed, and with a leaf blower put out fires around most trees. Still have some other areas to burn and should get them done this weekend. Overall was very happy with the burning, got rid of most the duff and exposed bare dirt in many areas. There was quite a bit of big blue here but there is a lot of this grass throughout too. I believe it is switch grass, but conformation would be appreciated. On the better soil and my most open area I decided I am going to try some switch grass this year, only about an acre. I should have seed tomorrow and should have planted by the end of the week. I'm going to spray with a heavy dose of roundup and select in late April/early May, but I can go ahead and put Atrazine down any time right? The area the I am planting with switch grass I can mow all of it easily so if the herbicides don't keep things knocked back enough I will be able to keep things in check with the mower. The remaining acres I am just going to hit with select/roundup and panoramic, and see what I have at the end of summer. With the biggest priority killing the fescue out as good as possible. At that point I will see what I have and either do a fall kill and do all remaining acres to native the following spring. I only lost a few small cedars to the fires, I really had expected to lose more than I did, so I was very happy with the outcomes. Really think I will have better results from my herbicides and existing natives by removing all the dead fescue buildup. Thanks for the input and the ideas on how to tackle this, hopefully conditions are good this weekend to finish up my other areas I would like to burn and then I will just be waiting until time to start my herbicide applications. Sligh1 and IowaBowHunter1983 like this. As a fellow Kansan I would broadcast switch grass seed which is beardless so it can be broadcasted with a regular broadcaster.You will want to make good seed to soil contact.I have planted kanlow,blackwell and cave in rock .The switch stands up better than big blue.You will get faster growth if you can frost seed on ground ready for decent contact.I don't know if anyone over on deerhunterforum.com has the old QDMA thread on frost seeding NWSG but it was really good.You can ride on the back of 4wheeler facing backwards and plant pretty fast,at 10 lbs an acre or so it's not that bad.If you want to broadcast a bearded seed the truax seed slinger is the only broadcaster I know of.Don't try it in a regular drill for sure. All the answers right here on switch!! Go get em. I’d spray atrazine a couple times if able & add post emergents with it until soil temps get to point where NWSG’s will germinate. U might get a flush of weeds but usually, with atrazine, if you do.... one mowing in July usually is it- done. Thought I would post a little update, from the above photos you can see i had a lot of areas dominated with fescue, I tried burning what I could and then put down a heavy shot of Roundup and atrazine, then hit it again with Roundup. Really happy with the results, only tried a smaller area and there is still some fescue but a tremendous addition of better cover. Thinking I'm going to go and hit all the areas I can get to with Roundup or Roundup and Oust and knock the crap out of the fescue right now and then do the same thing in the spring with Roundup and atrazine. On the area above I broadcast some switch grass, and I think I'm finding some seedlings, but the big blue and Indian grass really came on. Still plenty that I can improve on, but the vertical height of cover went from a foot tall to 5 feet or more tall just by hammering the fescue. HawkeyeStateHogs, MN Slick, Sligh1 and 2 others like this. Love it!! Great work releasing the natives! Fire alone will do wonders. Nicely done! Looks really good! Quick question, There is a lot more area im trying to accomplish the same thing on, want to start trying to get fescue under control this fall and hopefully have even better results next year. So my question is how hard is Oust on trees? most of these areas Im going to try and get the fescue controlled in has lots of trees. I can navigate easily with ATV and boomless sprayer, but how much damage would Oust do to trees? Oust sounds like the best way to long term control fescue and give natives the best chance. Most of the trees are larger Walnut and Cedars, I also have a bunch of oaks planted and they are all tubed. Rough plan was to cover as much area as possible with boomless sprayer with a mix of Clethodium, crop oil, and Oust, I would damage/kill way to many smaller trees if I went the roundup direction. What rate on the Oust could I run? Very little in the way of natives or forbs growing in these fescue areas, I know I could wait until after a frost, but in reality, wont be killing much natives, so would probably just do it now as the fescue is out of dormancy from the summer and is growing like crazy right now.